Check it out! Just as Mommy was packing up my Target Haunted House scratcher, a box arrived. She ordered this year's Holiday Gift Box Cat Scratch House and Gingerbread Cat Scratch House because they were on sale and available with free shipping. Last year's Gingerbread House is in the basement with the Christmas decorations. Four scratch houses...one kitty...uh oh. Ya better get ready for a lot of scratchin! We wish we had one of those gingerbread houses. My cat bro Bert is handsome, and love scratch items. I can box him up and ship him to you if you would like another cat! Sure looks like a fun thing to scratch and play with. We wonder if one of these is in our future too. Hmmmm.... Is there something your Mommy isn't telling you, Mudpie? Will there will be some new tenants for those cute houses? You are definitely one lucky kitty, Mudpie! All your scratching needs met right there, Mudpie!!! That's absolutely adorable! Rosie is happy to come over and help you. 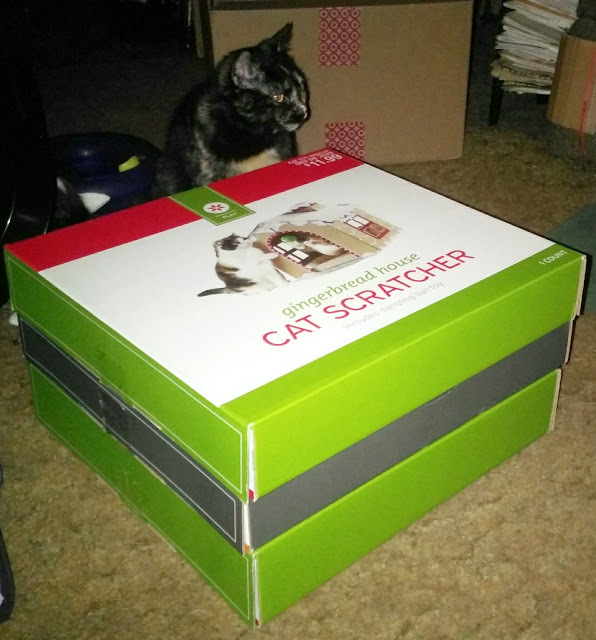 You are set for years of scratching!!! Thanks for checking on Georgie! Emma here again. Thanks to your post here, cat bro Bert is getting his own scratcher gingerbread house. Mom thought it was so cute, googled it, and ordered it. Bert will love it, and Sophie might enjoy it too. Dat looks so cute. Betcha' yous'll be able to use 'em all wiffout any help Midpie. Have fun. Maybe they’re for your shelter? Otherwise some kitty is very spoiled and lucky to live in a big house with storage. Whenever I ax for something, the peeps tell me there’s no room. You go, MP!